That's Right. 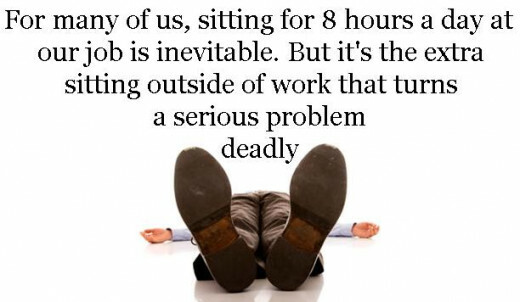 Sitting 6+ hours per day will raise your chance of dying in the next 15 years by a massive 40%. And research shows that not even exercise can offset the negative effects of prolonged and regular sitting. 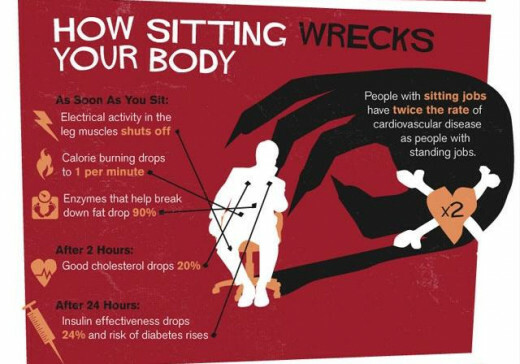 No Surprise: Sitting makes us fat. Keep reading to discover some alternatives to sitting. Did you Know sitting can place stress on the neck, shoulders, lumber region and circulatory vessels. Those who sit three hours or more per day watching TV are 64% more likely to die from heart disease. Every extra hour over the three spent watching TV, equates to an 11% higher death risk. In the past it was recommended to do thirty minutes of exercise to offset the effect of sitting. Now we know that's not the secret. The secret: eliminate, minimise and interrupt sitting as much as possible. What method of reducing your sitting time will you use? This definitely gives me food for thought! I started a sit down office job about a year ago. 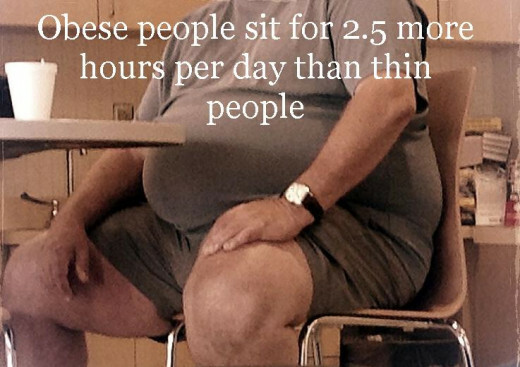 Although I'm still active and fit, it worries me that I have to sit so much. I'll definitely look into a standing work station. Thank you! This is useful and well written. I think most of us know this and yet, we still sit and sit and sit...LOL I do make an effort to move around perodically. Your hub is reminding me that I actually show make even more of an effort. I kinda like living. @Jodah~ Thanks. Yes, I had read a lot too, which is what inspired the hub. There have also been other studies on the risks of standing too long in one place. 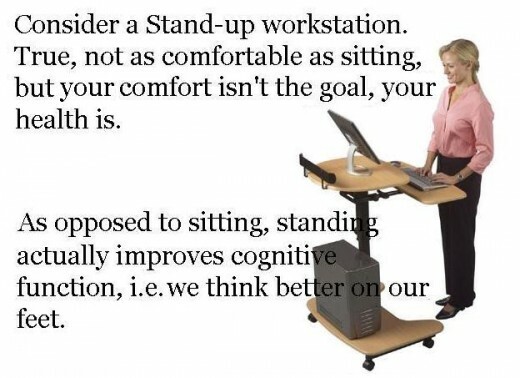 They are not as bad as sitting too long, but I think a solution that incorporates as much movement as possible is best. Good hub. I have read a lot about this recently, and it seems the studies are quite spot on and can't b disputed. 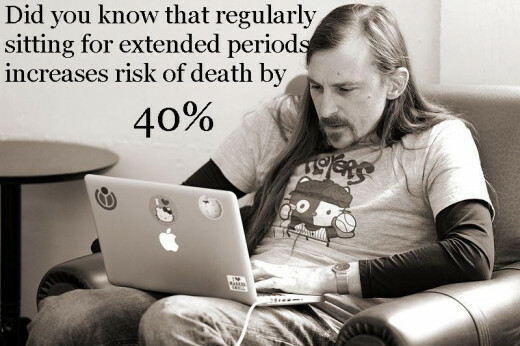 I generally sit for an hour or so, then go and do something else. Voted up. @swiiliams ~ that's my pleasure. thanks for the vote. have a great day. This is a very useful article, thanks for the helpful information! Voted up! @Billybuc ~ That's my pleasure. Of course, standing for too long has its own downsides, but none as dramatic as that of sitting for too long. I find alternating between standing and then sitting only when tired, and plenty of breaks to do a short activity in between works best. Thanks for commenting. @Faithreaper ~ Yes, I'm pleased to see that of those taking the poll, most watch very little TV. But, as you say, being a writer sitting at a computer can be even worse than watching the box. Glad to hear I've inspired you to better health habits. God bless. @FlourishAnyway ~ In fact many secretaries today are probably more aware of the importance of breaking up sitting stints than the rest of us. Thanks for the share and the comment. @NancyOwens ~ Yes, standing isn't always the best or most comfortable. I like the semi-sit-stand stools that are available. Bit expensive but a good investment. I think using a break to get other essentials done is a wise use of time. thanks for commenting. @MsDora ~ Little jigs are a great idea. I have a few yoga poses borrowed from my wife that i regularly do in between writing stints; very helpful. @Stuff4kids ~ let the lobbying begin. I like your suggestion of two workstations, one for standing the other for sitting. Appreciate your encouragement, sharing and support. 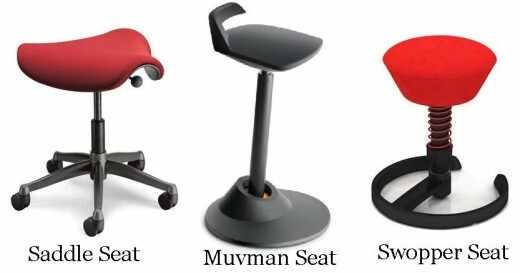 @RTalloni ~ Yes, i think if people are going to choose to sit, they definitely need to invest in an ergonomic seat. Thanks for reading and contributing. @Kathleen ~ I know the feeling, my legs tend to protest when standing too long. I tend to think alternating between seating and standing is best. Too much of either unhealthy, movement is the goal. @Frank ~ Glad you enjoyed, hope it helps. How can I sleep if I sit less than three hours a day? Sheesh! I try to stand as much as possible actually, Im just lazy. I've been considering setting up a permanent stand up workstation for sometime, and have actually improvised the idea in the past. Now I know why. :) BTW, I've found sitting on an exercise ball is be really helpful for lower back issues. Fabulous! 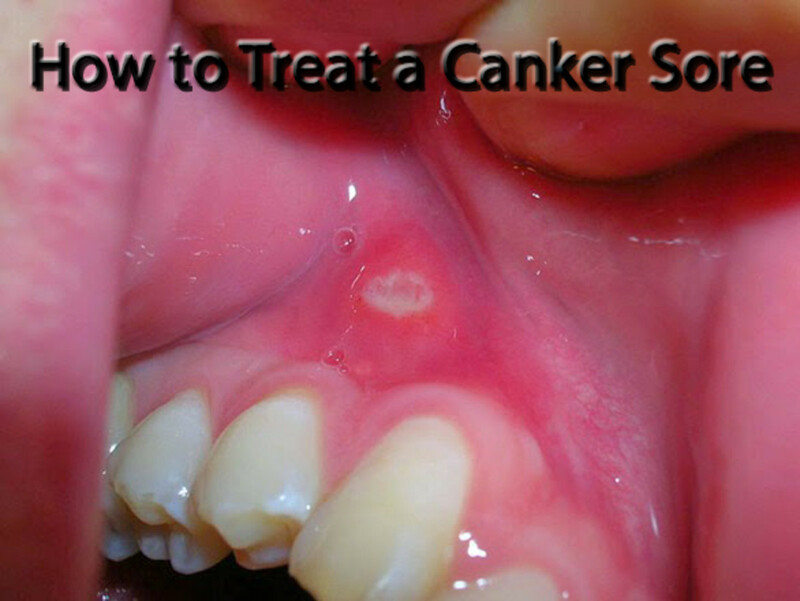 More people should know about this. I do sit when working (writing) but I also have a table-top lectern which one of my sons made for me (he's a professional carpenter) so I can also stand and work. So during the day, I alternate between sitting, always maintaining a good posture, and standing at the lectern where I can continue to write and read either by hand or on the laptop. I couldn't stand all day at my age but I do find that my most creative output is achieved standing at the lectern rather than sitting at the desk-top. In fact, I realize now that I tend to study at the desk and get creative at the lectern. I've voted this up and I'll be sharing it with my followers - as presumably they are all writers, too! I recommend that folks who work in offices should lobby their employees with scientific evidence (there's plenty of it) to support some stand-up desk options in the workplace. Wow! You really make it sound serious--like it really is. I once had a supervisor who told us to stand up every two hours, even if we only did a little jig and sat down again. I have to remember this. Thank you. Very good advice, I do know that sitting broadens one, and I don't mean the mind. I know that cortisol can cause Cushing Syndrom which my cousin has as I wrote about in "The Nightmare Before the Diagnosis of Cushings Syndrom. This should help a lot of people. Thank you for sharing this. One thing I do is to take short "work breaks" I get up and do some household chores for 10 minutes or so every hour or so. I can do some things standing up, but other things I just can't seem to work right while I am standing. They used to call it "secretary spread," but given all the time people spend sitting it's not just them. Dour by the hour is right. Voted up and more, sharing, and pinning to my "Health and Medical Interest" board. Well done! Yikes, I am in trouble. Thank you for this important hub here for one's health and long life. Of course I sit at the computer all day at work in the legal field and most days are so busy, I forget to get up and walk around, other than performing other tasks. Thankfully, I do not watch much television at all; however, I do come home and write in the evenings some of the days of the week. I am going to get up and get going! There is nothing more to add to this. Everything you say is right on of course. I started standing at the computer a couple months ago...not for the entire day of writing, but every little bit helps....right? Thanks for the gentle nudge in the right direction.